MobiAccess - One solution for all platforms! MobiAccess is a mobile development framework that enables developers to easily create mobile applications for data collection without extensive knowledge on mobile development. It handles data replication (mobiSync) and data visualization (mobiVision) as well. What can MobiAccess Development Framework offer to you? At last, this is now achievable with MobiaAccessTM! MobiAccess is the right solution that solve all these questions. MobiAccess has several independent components and modules. For the supported mobile platforms (Windows Mobile PDA, Smartphones and industrial data collector terminals; Symbian, BlackBerry and J2ME phones) mobiVision Mobile is the end-user interface. For Tablet PCs, Notebooks and Desktops mobiVision Desktop is the visualization tool. As well as it is the management interface for the synchronization process and right management. The synchronization process is operated by synchronization server (mobiSync Server) and clients (mobiSync mobile and mobiSync Desktop clients). 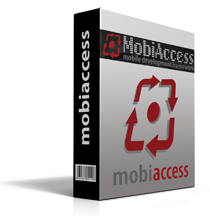 Our MobiAccess Development Framework 3.1 Demo is available for 1 mobile client or 1 desktop and half year.